I haven't done a High Five for Friday post in months. I thought today would be a good day to do so as it's a good way to share what's new with me a little bit too! So here are five of my favorite things at the moment. 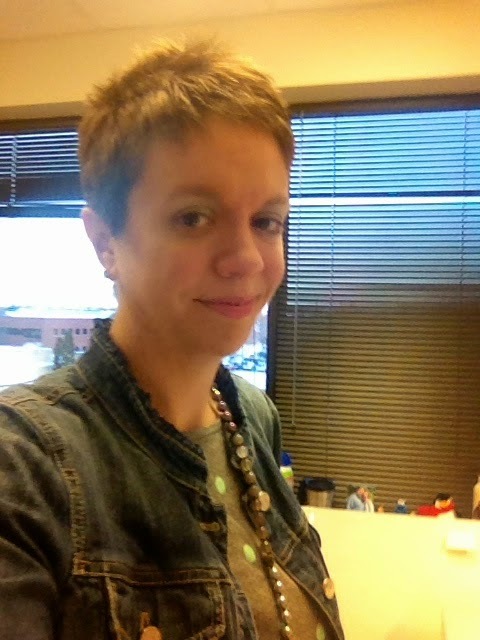 Haircut - It seems like I've been making changes to my pixie cut a lot in recent months but I think I finally stumbled onto what I have really been wanting to do. Basically I was tired of my side swept bangs, so it was either try to grow them out or go all out on cutting them super short. I'm not a very patient person so I bet you can't guess which option I chose. Short spiky bangs for the win. I'm just not meant to have longer hair. I'm a short hair girl for life I think. Bye Bye to Bessie - As long as Oliver does well with bottles of only almond milk (the dairy free alternative we chose after confirmation of his cow's milk allergy), we have made the decision that I will stop my daytime pumping sessions. I had still been pumping twice a day, especially after he was so sick and only really able to handle breastmilk for a bit, but now that he's well it seems like a good time to try. I've been mixing his bottles to be half breastmilk, half almond milk, but now we're going to just go straight to almond milk. He seems to like it in his oatmeal and I think he's going to be fine with it. I am SO happy to be done pumping I could dance. I am going to continue to nurse Oliver for now a couple of times a day though - he'll get his morning and evening nursing sessions and probably a little cuddle at lunch during the workweek. We'll work towards weaning those eventually too, but for now he still seems to enjoy and need it - and quite frankly so do I. Nate said the other night, "you seem to enjoy the nursing, just not the pumping, so I don't see any reason for you to totally stop right now." But otherwise, farewell Bessie the Breastpump - you served me well, but I'm glad to put you away now! Shows returning from break - We have a bunch of shows that we love that seem to come back at this time of year instead of the Fall. Shameless, Parks and Recreation (last season, sob), Portlandia and The Americans will all be back with in the next couple of weeks and I'm super excited about it! Of course we would start another show from the beginning at the exact time all of our favorites are coming back - we started Homeland and man, we're hooked. New skills - Oliver is learning new skills by the day it seems - he is actually starting to try to repeat words when we say them to him, and while it's still mostly gibberish, things are starting to make sense. I love listening to him babble, he has the sweetest little voice. He's getting more and more interested in his toys and independent play. We're getting soooo close on the walking front but not quite there yet, any day now I think. 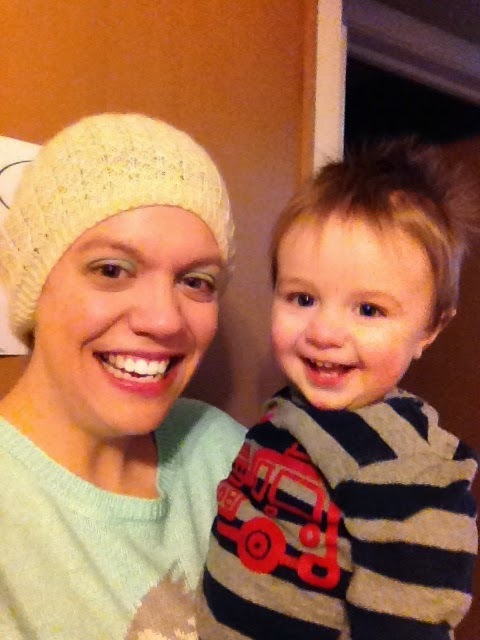 And he totally understands taking selfies with mama, I pull the phone out and he smiles immediately. It's pretty freaking cute. Tea - Nate had a bit of a chest cold last week and decided to start drinking hot tea at home again - I love tea too, what I love the most is while there is caffeine, I seem to have no problem drinking it into early evening and having it keep me awake the way coffee does. If anything, tea relaxes me. So my favorite thing right now is we'll make a pot of tea to share in the afternoon on the weekends. It's been great since it's been so crazy cold! Nate bought himself some items to allow him to make tea for himself at work during the week and I have to say, I'm slightly jealous! So there you go! I'm celebrating surviving an entire full week of work for the first time since I believe the second week of December. I'm looking forward to the weekend though! Hope you all have a great one! Thrift Style Thursday is BACK!